Roman sculpture is interesting partly because it is so derivative, partly because it is so thoroughly political, and partly because it has, on occasion, so human a face. The Ludovisi Throne (Altemps Museum), perhaps the most beautiful object in Rome--but not Roman. It's likely Greek, possibly from the 5th century B.C. The subject on the long side is the birth of Venus; on the visible short side, a girl plays a flute. 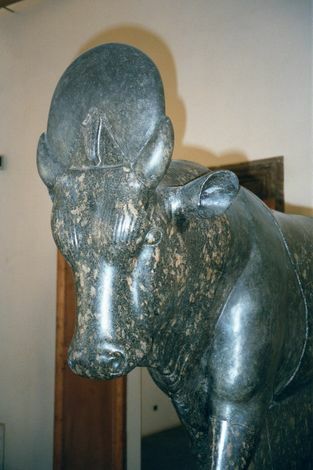 In the same museum there's this fine Apis, a bull represented in Egyptian religion with the disc of the sun between his horns. Apis is an old deity, going back to the first dynasty, but in early Roman times he merged with Osiris and as Sarapis diffused from Alexandria to become a popular fertility cult throughout the Roman Empire. This particular statue, also in the Altemps museum, was carved in Egypt in the 2nd century B.C. 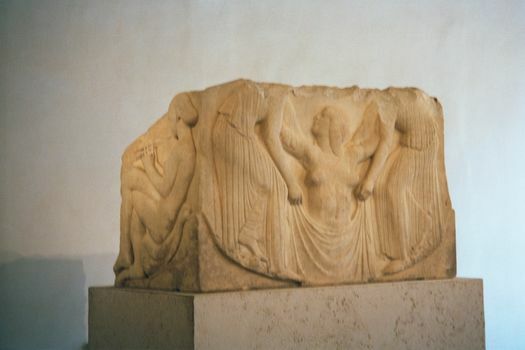 A more typically Roman subject. 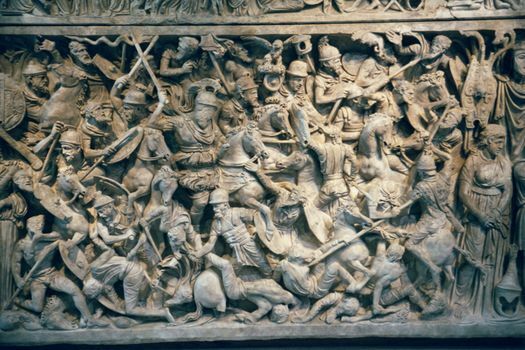 The is the side of a sarcophagus now in the Palazzo Massimo and showing the Romans as invincible. The barbarians die like flies. 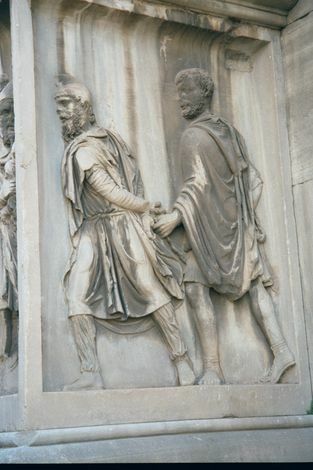 From the arch of Septimius Severus, Persian captives. A Dacian (more or less, Romanian) prisoner, 2nd century AD (Vatican museum). The dying Gaul was a popular subject, both because it celebrated martial virtue and because it made Roman power seem all the more irresistable. In this case, the dead or dying wife hangs from one savage arm, while the other stabs the savage heart. From the Altemps museum, this statue is a Roman copy of a Greek bronze from the time of Julius Caesar. 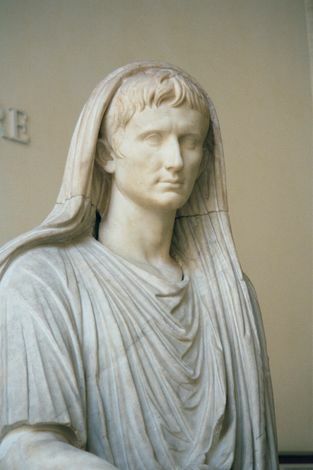 Augustus Caesar as Pontifex Maximus, in the Palazzo Massimo. The statue seems benign but indicates a totalitarian consolidation of political power: Augustus controlled all the levers, spiritual as well as martial. Images of the emperors were not only carved in profusion but air-brushed to make them look the part. 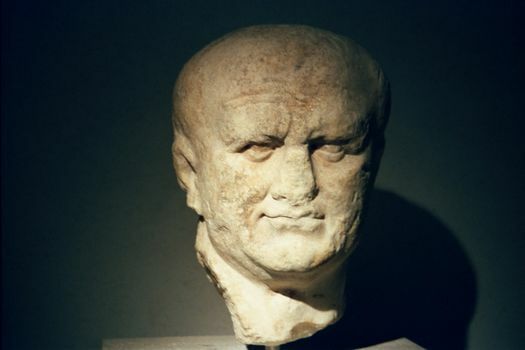 Here, from the Palazzo Massimo, an image of Vespasian intended for public display. 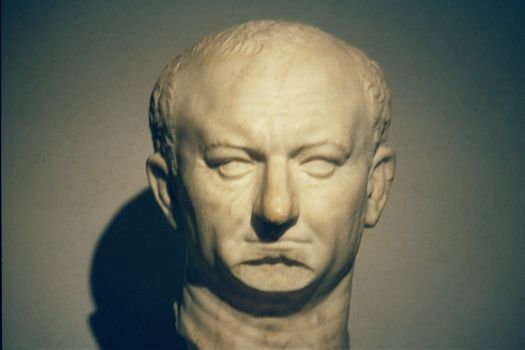 Another image of Vespasian, also in the Palazzo Massimo, but this time intended for use within the family. 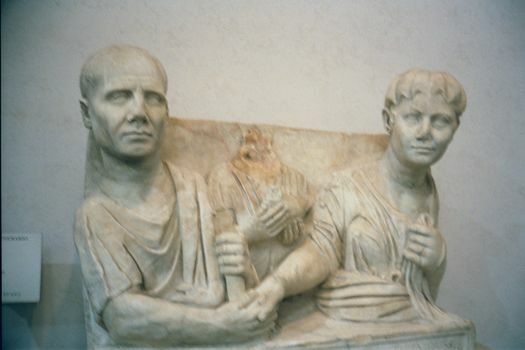 The Romans could, under the right circumstances, create likenesses of great verisimilitude. Here, Pompey, from the Vatican museum. Such honesty, combined with a surprising degree of domestic tenderness, was common on sarcophagi, like this one from the Palazzo Massimo. Later sculptors depended heavily--sometimes slavishly--on their antecedents. 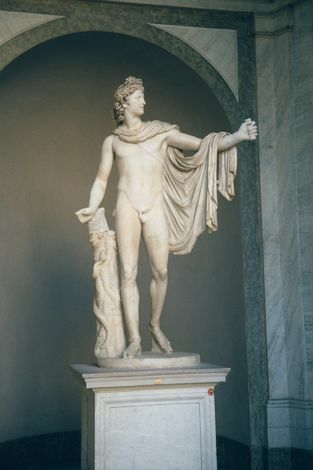 Consider the Apollo Belvedere, in the Vatican Museum. It's a Roman copy from the second century of a Greek bronze cast perhaps 500 years earlier. 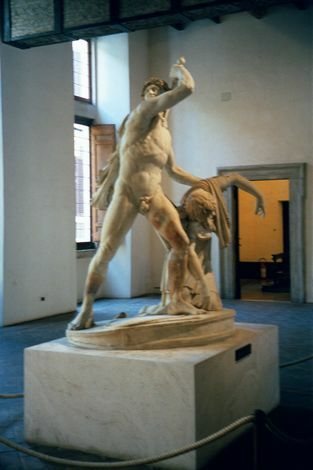 Perseus stands a few feet away in the Octagonal Courtyard of the Vatican's Belvedere. 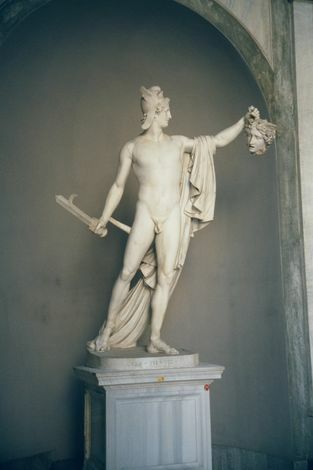 The statue is by Canova (1757-1822), some 16 centuries after the Apollo. 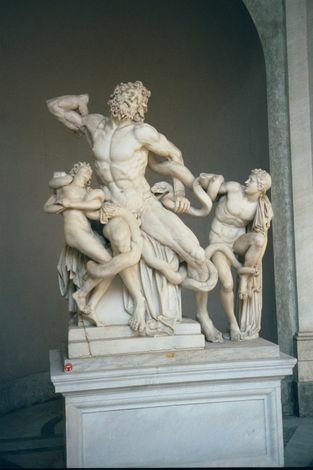 This famous statue of Laocoon and his sons was carved by Hellenistic Greeks from Rhodes and was housed originally in the palace of Titus. Michelangelo admired it. It, too, like the preceding pictures, is in the Belvedere. 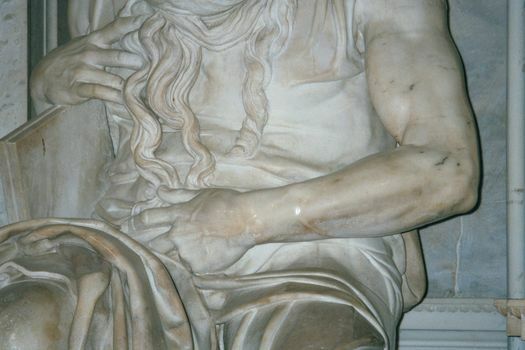 A decade after the Laocoon was rediscovered, Michelangelo carved his hard-muscled Moses. It sits a short distance north of the Colosseum, in the church of San Pietro in Vincoli. 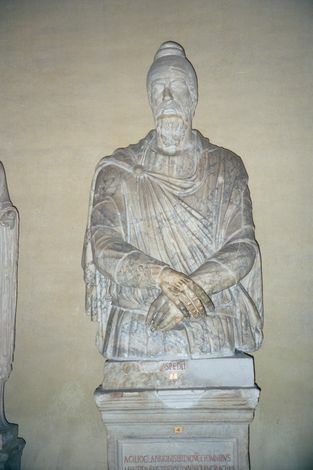 Michelangelo's statue in its entirety, unnaturally tense. 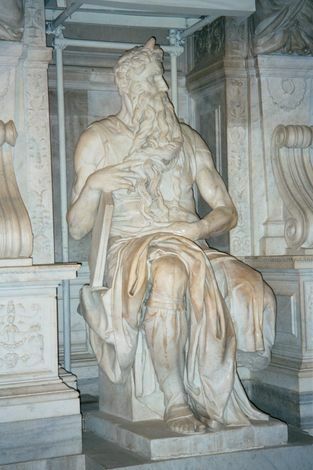 Freud is said to have speculated that the muscles were bulging because Moses had just sat down after an angry moment. 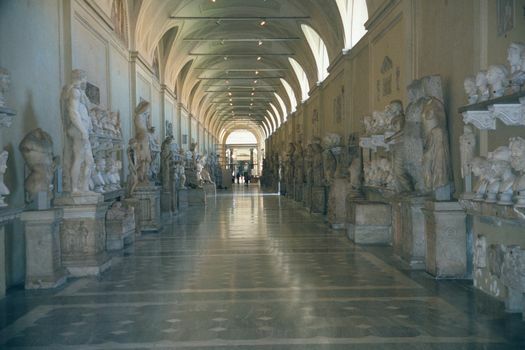 Museums transmit the classical heritage: here, the Chiarimonti Museum, in the Vatican. 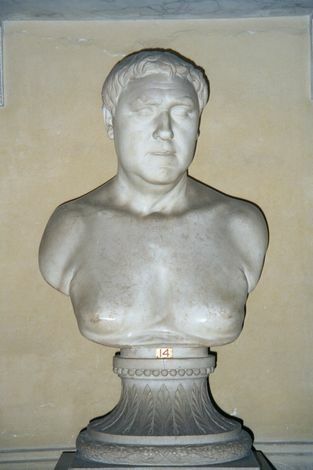 It was assembled by Canova for Giorgio Chiarimonti, Pius VII (1800-23). It's changed so little since then that it itself has become part of the city's heritage.